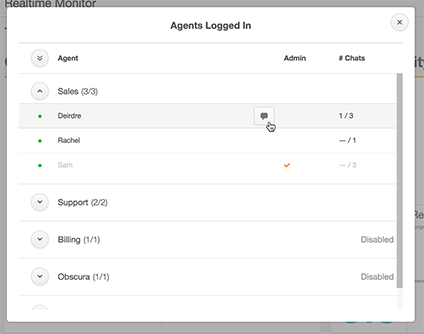 This article decribes how to chat from the standalone Zendesk Chat dashboard. For information about chatting from within Zendesk Support, see Using Zendesk Chat in Support. This section describes basics of how to chat with visitors to your website. To learn about chatting with agents, see the next section. To start chatting with a visitor, click Serve 1 request in the bottom left corner. You can proactively start chatting with visitors by selecting them from the Visitor List. From the Visitor List, you can see details about all the visitors currently on your website, including their location, the page they're on, and their chat status. For example, you might want to reach out to visitors who have items their shopping cart but are taking too long to complete their purchases. For more information, see Browsing your site's visitors. From the dashboard, click Visitors. Click a visitor's name in List mode. Type your message in the chat window and press Enter to send. Click the History icon in the chat window to review the visitor's chat history. Click on a conversation to view its transcript. Click the Info icon in the chat window to view or edit the visitor's contact info. This is the information that will be used for the ticket requester if you create a ticket from the chat. When you're finished with a chat, click End Chat to end the conversation. You can transfer the chat to another department or to a department you're in as long as you're not the only agent online in that department. If you transfer it to a department you're in, you won't get the same chat again. Transferred chats are added to the bottom of the chat routing queue. Select Invite Agent/Transfer to Agent or Transfer to Department from the chat window's Actions drop-down menu. Select a department from the drop-down menu or enter an agent. You can chat with other agents either by adding them to an existing conversation with a visitor or in a separate chat without any visitors. Select Invite Agent/Transfer To Agent from the chat window's Actions drop-down menu. Enter the agent in the Agent Email field. To leave the chat and have the other agent take over, click Transfer and Leave. To add the agent and stay in the conversation, click Invite. To start a conversation with just you and another agent (no visitors), click Team on the from the left bar, then click the agent's name to open a chat. Hi, I have a question about how Zendesk Chat can be used without Zendesk Support. Is it possible for a summary of the chat (details of caller, agent, transcript, etc) to be sent via email, maybe to another system, once the chat has ended? Any ideas why the transfer options are grayed out for me? I have other multiple agents signed in as well. We do not have Departments set up, but it sounds like that shouldn't matter. That's a bit odd, so I'm going to pull this into a ticket in order to troubleshoot this in more detail. I'll be reaching out soon on that ticket!